OPEC will hold an emergency meeting only if oil climbs above $100 a barrel and stays at that level, a Gulf delegate said on Thursday. A second Gulf delegate said the price strength would probably not last and customers were not asking for extra oil. value. They do not want to be paid in devalued currencies. Neither do producers selling precious metals, fertilizer, farm products, etc., which is one reason why wholesale food prices are going zoom, zoom, zoom. Please. How many times does OPEC have to play this game for guys like Williamson to catch on to the con? OPEC isn’t sitting on its hands because they don’t want to take our yucky devalued dollars. In the short term they can hedge against the dollar just like anyone else if they want to, and in the long term they can invest the surpluses in their sovereign wealth funds in any instrument they feel like. The reason for their apparently lackadaisical attitude is much simpler: they’re already pumping at near their maximum production capacity. 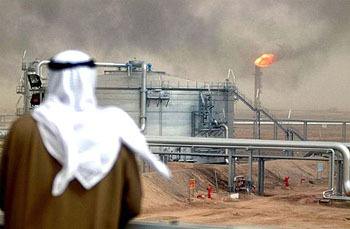 Iraq will probably be able to produce more someday if they manage to avoid another civil war, and Saudi Arabia claims to be working on plans to increase their pumping capacity too. Target date is somewhere around 2014, I think. But right now? What you see is what you get. The only thing an OPEC meeting would produce is yet another tortured explanation about why OPEC isn’t increasing its production quotas, explanations that usually range from the hilarious to the pathetic in their effort to avoid saying the obvious: there’s no more oil to pump, so quotas are going to stay where they are no matter how much anyone wishes otherwise.